The picometre's length is of an order such that its application is almost entirely confined to particle physics, quantum physics, chemistry and acoustics. Atoms are between 62 and 520 pm in diameter, and the typical length of a carbon-carbon single bond is 154 pm. 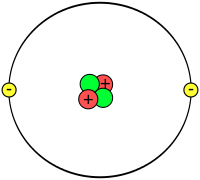 Smaller units still may be used to describe smaller particles (some of which are the components of atoms themselves), such as hadrons and the upper limits of possible size for fermion point particles. The Laser Interferometer Space Antenna (LISA) probe is planned for launch in 2034 to directly detect gravitational waves and will measure relative displacements with a resolution of 20 picometres over a distance of 5 million kilometres, yielding a strain sensitivity of better than 1 part in 1020. ↑ "Atomic radius". WebElements: the periodic table on the web. ↑ Deza, Elena; Deza, Michel Marie (2006). Dictionary of Distances. Elsevier. ISBN 0-444-52087-2.